Coreopsis, or Tickseed, is an extremely adaptable and easy growing perennial flower. Most gardeners are familiar with the sunny yellow blooms of Coreopsis grandiflora. There is actually a good amount of variety among Coreopsis and their numbers increase every year. There are tall, fluffy Coreopsis, red and pink Coreopsis, even annual flowering Coreopsis. Here are a handful to get you growing Coreopsis. Coreopsis grandiflora has been gracing gardens for generations. It makes an excellent perennial plant for novice gardeners, but experienced gardeners will also appreciate its reliability, ease of growth and the way the color blends so well with just about anything. Coreopsis grandiflora can grow in just about any soil, even shallow, lean or chalky soil. It is open pollinated, so it can be grown either from seed or by division. It will also self-seed, but not to the point of annoyance. If you don't want the volunteers, simply deadhead the plants before they go to seed. Height: 18 - 24" Width: 18 - 24"
Notes: Benefits from a shearing after the initial bloom fades. Will spread by seed. Coreopsis grandiflora are exuberant plants and will happily spread out in a garden. Coreopsis 'Heliot', a Fleuroselect Gold Medal winner, was bred to stay tight and compact - perfect for a smaller garden or containers. The flowers are single with a burgundy ring around the center disk. They are not as full as the double Coreopsis grandiflora, but they bloom from early summer right through to frost, even the first year of planting. Height: 10 - 14" Width: 10 - 12"
Notes: Benefits from a shearing after the initial bloom fades. Divide every 3 years to maintain ​​the plant. Coreopsis 'Rising Sun' is another Fleuroselect Gold Medal winner. Coreopsis 'Rising Sun' is unique in a couple of ways. First, it begins blooming weeks earlier than other varieties of Coreopsis. Then there's the flower itself. Coreopsis 'Rising Sun' has semi-double fringed golden flowers with a red dot at the base of each petal, giving it the name of 'Rising Sun'. The 2-inch flowers are relatively large for a Coreopsis. The growth habit and ease of maintenance are still everything you'd expect from a Coreopsis. Height: 18 - 24" Width: 15 - 18"
While all Coreopsis are carefree, the Lanceleaf Coreopsis, a North American native, is virtually foolproof. All it asks for is lots of sunshine and well-draining soil and it will bloom its heart out all season long. Lanceleaf Coreopsis has a more open, airy form than Coreopsis grandiflora, although not as airy as the threadleafs. Lanceleaf Coreopsis has a bit of a wildflower look that blends well in cottage style gardens. The flowers follow the sun, so position where you'll enjoy the view when you're around. Height: 12 - 18" Width: 18 - 20"
When Coreopsis verticillata 'Moonbeam' came on the market, nurseries couldn't keep it in stock. The buttery yellow flowers were too irresistible for any gardener to walk past and not lust after. And then there was that foliage. Thread-like wisps of green that softened the look of the garden, almost to a blur. Coreopsis 'Moonbeam' is indeed a stunning plant. Although Coreopsis 'Moonbeam' shares its species' ease of growth, it does tend to be less long-lived than most, often disappearing from a garden within 3 years. Then again, it has been know to travel a bit and pop up in another part of the garden where, no doubt, it will be just as welcome. It's impossible to say how it will perform in your particular garden, but it's worth the try. Coreopsis 'Moonbeam' blends into any garden design. Height: 18"' Width: 12 - 18"
The thread leaf Coreopsis verticillata are increasingly popular. The feathery texture of the leaves and the profusion of bloom are certainly worthy features. However, some of the threadleafs can become wispy and floppy as they age and some are very short-lived. Coreopsis 'Golden Showers' is able to hold its flower stems tall and sturdy throughout the season. It tends to form a nice size clump, rather than traveling around your garden. And it stays around for several years. Like all the Coreopsis, it is very tolerant of hot, dry weather. Shearing the plants back by about 2/3s, once the initial blooming is finished, will refresh the plant and set new buds. Height: 24 - 30" Width: 18 - 24"
Coreopsis 'Limerock Ruby' came onto the scene when the threadleaf Coreopsis were peaking in popularity. Every gardener had to have it, even those who didn't really like red in the garden. Unfortunately Coreopsis 'Limerock Ruby' was put on the market before its hardiness was fully tested in a variety of climates and many northern gardeners were disappointed to find that Coreopsis 'Limerock Ruby' did not return the following year. It has since been re-listed as a USDA Zone 6 plant, rather than the USDA Zone 5 it was originally designated. There have been more introductions, like the pink Coreopsis 'Limerock Passion' and the tangerine Coreopsis 'Limerock Dream', that keep the interest in Coreopsis plants going strong. 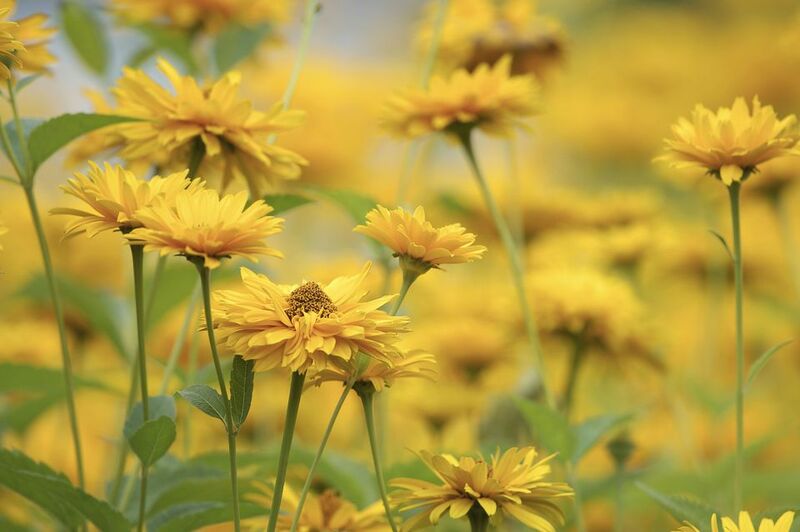 What all the Coreopsis varieties share is the feature of never disappointing on blooms. Weather your lasts for years or gives you only a season of pleasure, you will still feel you've gotten your money's worth. Height: 18 - 24" Width: 24 - 30"
Abutilon - Grow a Houseplant that Never Stops Blooming.